(CNN) -- Companies involved in the sinking of the offshore drilling rig Deepwater Horizon made "some very major mistakes," Interior Secretary Ken Salazar said Thursday after meeting with executives from the oil company BP. Salazar would not elaborate, telling reporters in Houston, Texas, that the cause remains under investigation. But he said the failure of the rig's blowout preventer -- a critical piece of equipment designed to shut off the flow of oil in an emergency -- was "a huge malfunction" that has left oil gushing into the Gulf of Mexico. "The investigation will lead to conclusions about what exactly happened, but it didn't work the way it was supposed to work," Salazar said. "And from my own preliminary observations, there were some very major mistakes that were made by the companies that were involved. But today is not really the day to deal with those issues." The Coast Guard and the Interior Department's Minerals Management Service are leading the investigation into the loss of the drill rig, owned by BP contractor Transocean Ltd. The slick has been spreading across the northern Gulf of Mexico since late April, when the drilling rig Deepwater Horizon blew up and sank about 40 miles off the mouth of the Mississippi River. Eleven missing workers who were aboard the rig are presumed dead. BP owns the damaged well at the heart of the slick. Efforts to shut down the well have failed, leaving it spewing about 210,000 gallons (5,000 barrels) of oil per day into the Gulf of Mexico. There was no immediate response to Salazar's comments from BP, which has blamed Transocean. Salazar's meeting with BP executives -- his second trip to Houston in less than a week -- comes as oil washed ashore on Louisiana's barrier islands and drifted west past the mouth of the Mississippi River. Workers also prepared to lower a massive containment vessel over the Gulf of Mexico's two-week-old undersea gusher. 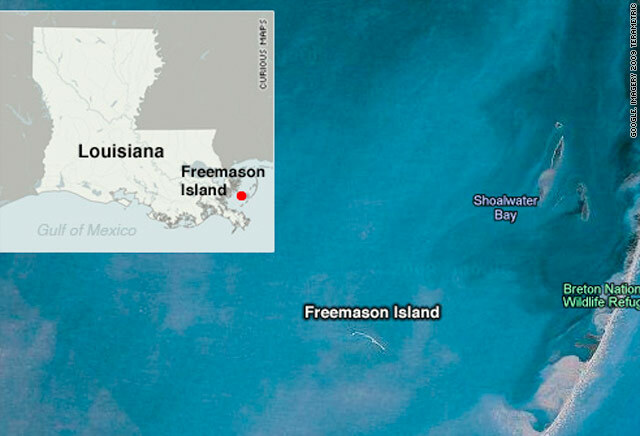 A pinkish-orange foam mixture of seawater and crude oil streaked across large stretches of water in the northern Gulf and turned up in the on the shores of the Chandeleur Islands, off southeastern Louisiana. Trace amounts of sheen had been reported on the shores of southeastern Louisiana over the past week, but the landfall reported Thursday appeared to the "first impacts" of oil from the spill, Coast Guard Rear Adm. Mary Landry told reporters. Doug Suttles, chief operating officer for BP, said mild weather gave cleanup crews more time to attack the spill. More controlled burns were conducted Thursday, after BP and the Coast Guard used fire to destroy several thousand barrels of oil on the surface Wednesday, he said. But the spill was spreading westward and is projected to drift toward coastal parishes past the Mississippi River delta, spurring Louisiana to begin shifting preventive efforts to its southwestern coast, Gov. Bobby Jindal told reporters Thursday. "That obviously opens up many more vulnerable areas along our coast," Jindal said. "We're going to do everything we can to keep this oil out." The National Oceanographic and Atmospheric Administration already has closed the area to fishing, restricting a multibillion-dollar industry in the region. Suttles said BP held a meeting with parish governments and state officials, who offered ideas for beating back the oily tide and leveled criticisms. "What's clear is this is their home," he said. "And what's also clear is they're passionate about protecting their home." Under federal law, BP is responsible for capping the well and paying for the cleanup. The company shipped a four-story-high containment vessel to the site overnight and expected to lower it toward the seabed nearly a mile below the surface late Thursday, Suttles said. The hope is that the container will collect the leaking oil, which would be sucked up to a drill ship on the surface. If the operation is successful, BP plans to deploy a second, smaller dome to deal with a second leak in the ruptured pipe. But getting the large structure into position could take several days, and the technique has never been attempted at the depth of these leaks. "If all goes according to plan by early next week we hope to make it operational," Suttles said. "As we always do, though, we stress this has never been done before. We'll likely encounter numerous challenges, but we'll remain committed to make it work." BP has stopped the flow of oil from one of the three existing leak points from the sunken rig, but it was the smallest of the three leaks and did not affect the amount of crude pouring into the ocean. CNN's David Mattingly contributed to this report.